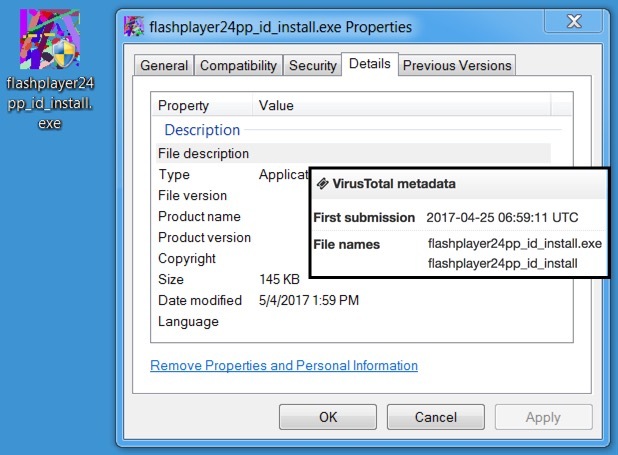 Saw a fake Adobe Flash site send Smoke Loader (disguised as a Flash Player installer) on 2017-05-04, but the sample was already submitted to VirusTotal on 2017-04-25. URLs associated with the Decimal IP campaign (Malwarebytes link) had been leading to Rig EK, but are now redirecting to a fake Flash Player installer page. It seems to be the same Smoke Loader this campaign using Rig EK to send last week. Shown above: Using the Decimal IP url from Zerophage blog post about the Decimal IP campaign. Shown above: Traffic from the fake Flash Player site filtered in Wireshark. Shown above: Smoke Loader sample from 2017-05-04 was around as early as 2017-04-25. Shown above: Post-infection traffic caused by the Smoke Loader sample from a pcap dated 2017-04-25. Shown above: Some alerts on both pcaps from the Emerging Threats and ETPRO rulesets using Sguil and tcpreplay on Security Onion.